VALIDATE DATABASE SPFILE performs a comparison of server parameter file (SPFILE) entries between the primary database and a specified standby database. VALIDATE NETWORK CONFIGURATION performs network connectivity checks between members of a broker configuration. VALIDATE STATIC CONNECT IDENTIFIER validates the static connect identifier of a database. SET ECHO controls whether or not to echo commands that are issued either at the command-line prompt or from a DGMGRL script. SHOW ALL (DGMGRL CLI properties) shows the values of DGMGRL CLI properties. The VALIDATE DATABASE SPFILE command performs a comparison of server parameter file (SPFILE) entries between the primary database and a specified standby database. The validation of the server parameter file detects parameter value discrepancies between the primary and the specified standby database so that they can be rectified before a role change, thus ensuring that after a role change the databases perform at the same level they did prior to the role change. Additionally, using this command frees you from having to restart a database to correct improperly set parameters. If the database to be validated is the primary database, then a message is returned saying the command cannot be issued on a primary database. This command cannot be used for the primary database. The VALIDATE NETWORK CONFIGURATION command performs network connectivity checks between members of a configuration. DGConnectIdentifier property of the associated database. Oracle Clusterware is not configured on database "dbwrstby". The VALIDATE STATIC CONNECT IDENTIFIER command validates the static connect identifier of a database. To perform this validation, the broker makes a new connection to the database using a static connect identifier based on the StaticConnectIdentifer property of the database. A new attribute, STATIC_SERVICE=TRUE is added to the connect identifier to ensure that a connection to the database is established using only a static service, not a dynamic service. The SHOW ALL command shows the values of DGMGRL CLI properties. Service "proddr" has 1 instance(s). Recovery Manager: Release 12.1.0.2.0 - Production on Sun Jan 27 16:15:10 2019 Copyright (c) 1982, 2014, Oracle and/or its affiliates. All rights reserved. Copyright (c) 1982, 2009, Oracle. All rights reserved. 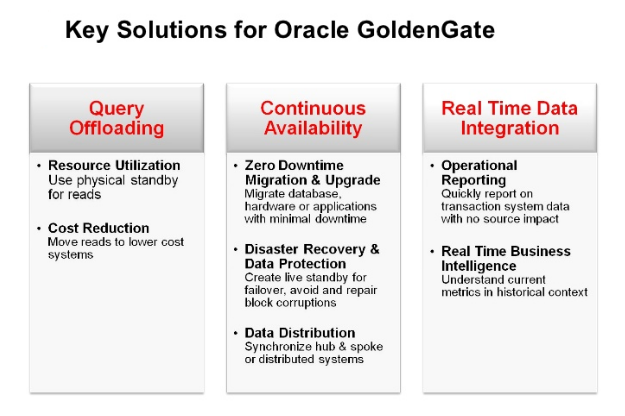 The configuration of Oracle GoldenGate / Data Guard has the purpose of synchronizing data between two or more systems . 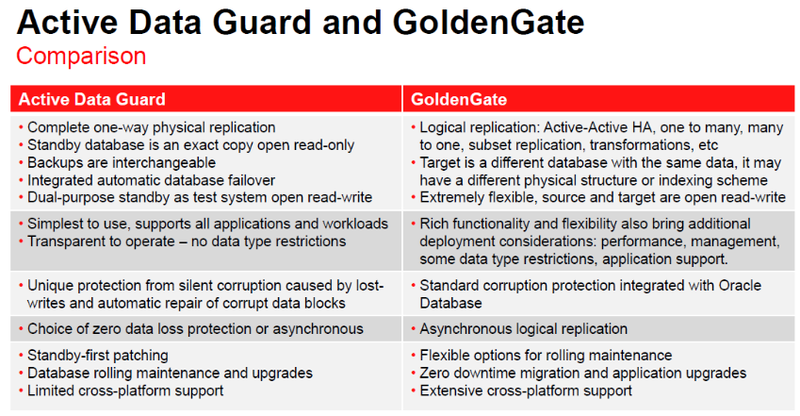 The basic features of the two products may look similar but takes GoldenGate uses replication while dataguard not. 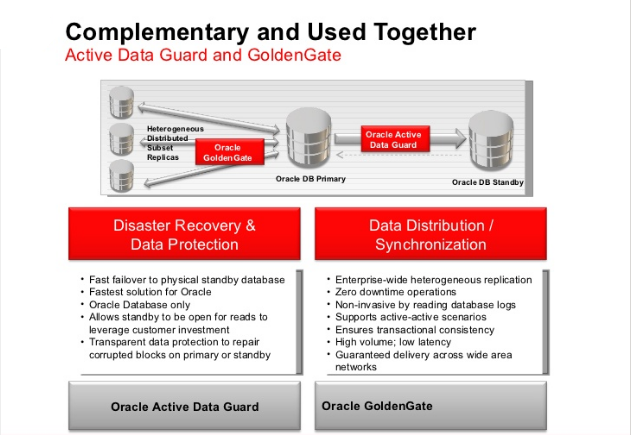 Oracle Data Guard and GoldenGate involving at least two systems where transactional data from one database is required to be moved to another database. 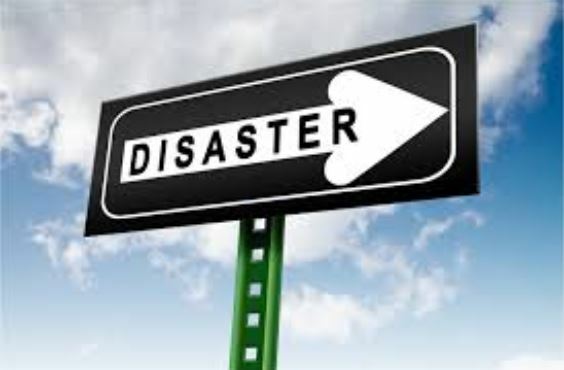 The purpose of the replication of data can be disaster recovery, migration of data or preparation of a secondary system. Data Guard is best for disaster recovery and data protection problems, GoldenGate is a more flexible heterogeneous replication mechanism and is also able to transform the data while it is being replicated. 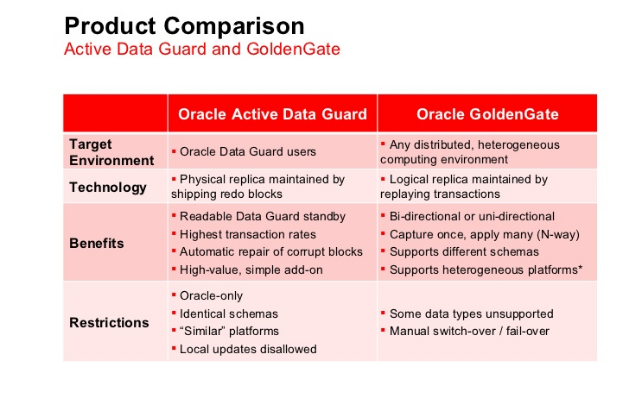 Data Guard is an Oracle specific technology while GoldenGate support heterogeneous database systems including all the major RDBMS as DB2,Sybase, MySQL . Data Guard supports active-passive replication. One of the database is the primary database and the other one is in an inactive Data Guard mode. GoldenGate supports an active-active replication mode and allows both systems to work simultaneously while maintaining the data integrity. 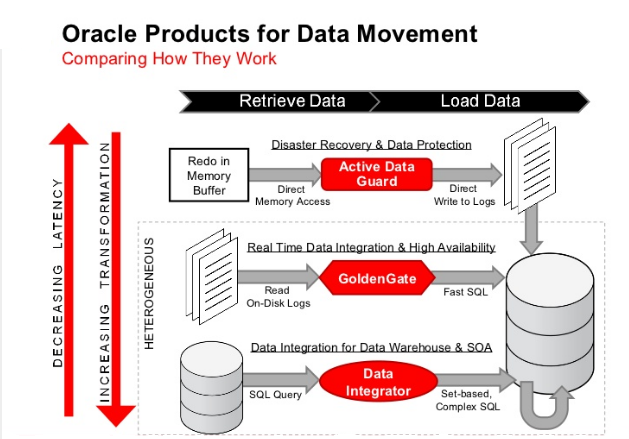 GoldenGate allows transformation of the data, with conflict management while it is being replicated between both database systems. 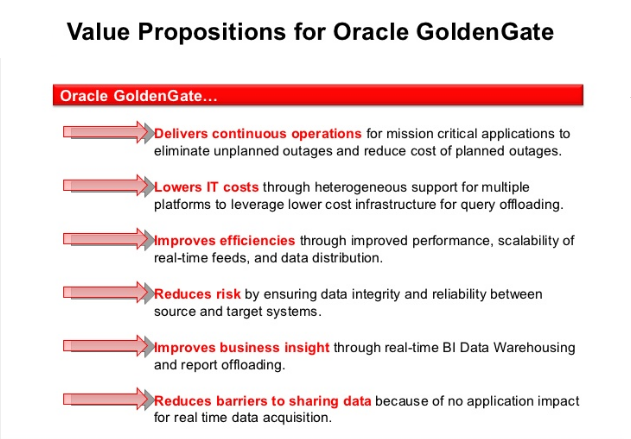 GoldenGate allows replication across platform. Data can be extracted from a Unix platform and replicated to an Oracle database running on platform Windows. Replicate one or many tables to a read-write database. Zero or near-zero downtime upgrade. • Zero Downtime Upgrade/Migration: You may want to setup an exact replica of your database for upgrade or migration, keep the data in sync till the last moment. • High Availability: Your applications cannot afford to have downtime so you want to have two databases up and running at the same time to support those applications. • Query or Reporting: You want to offload the reporting or long query operations from your production database. • Real Time BI: For your data warehouse requirements. • Data Synchronization: You want to Synchronize data across different departments of the company (different databases). Furthermore the GoldenGate software supports extraction from the legacy systems and does not have any limitation on the distance either. Additionally, the trail files generated by GoldenGate capture can also be compressed and encrypted. In a data guard environment, one database is a primary database, the others are standby databases. These roles are mutually exclusive. The role of a database can be queried in the column database_role in v$database. The primary db is the »real« production database. The primary db must run in archive log mode and with forced logging. Standby databases are (transactionally consistent) copies of the primary database. Up to 30 standby databases are supported. A standby DB is either physical or logical standby database. (A standby database can also become a snapshot standby database). A physical database is an exact byte-wise copy of the primary database. A logical database has the same data as the primary database, but is not necessarily stored in the same db blocks. The physical database is kept synchronized with redo apply, the logical database with SQL apply. A physical standby database might be configured to receive redo from a primary database and relay it to a another standby database. In this case, the relaying database is called a cascading standby database. The receiving standby databases is also known as a terminal destination. With such a configuration, the load on the primary database can be reduced. Some SQL*Plus statements come with the standby keyword which indicates that the statement should be applied on the standby databases. Archived redo log files from the production DB are copied to the standby DB. They are then registered with the standby DB. Finally, using media recovery, the redo is used to roll forward the standby database. A standby database validates the redo it receives from the primary DB. Thus, physical errors (such as data corruption) on the primary DB are not propagated to standby databases. A switch over is a planned role transition. In a switch over, the primary database becomes a standby database while (one of) the standby databases becomes the primary database. 2) a standby DB becomes a primary DB. 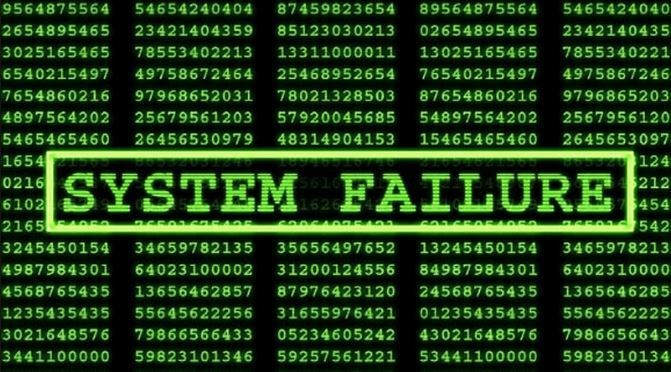 A fail over occurs when the primary database becomes unavailable. In this case, one of the standby databases becomes the new primary database. The primary db and the standby databases can be run as single instance or real application clusters(RAC). Thus, it allows to query the standby databases without impacting the performance of the production database (for example to create resource-intensive reports). The standbase database is called physical standby database. The buzzword is real time query. Active data guard must be licenced seperatly. Data Guard runs in one of three data protection modes. This allows to balance data availability against system performance requirements. # This script MUST run from the Primary DB server. In the previous article, we have performed the Oracle RAC to RAC physical standby database failover steps in 11gR2. 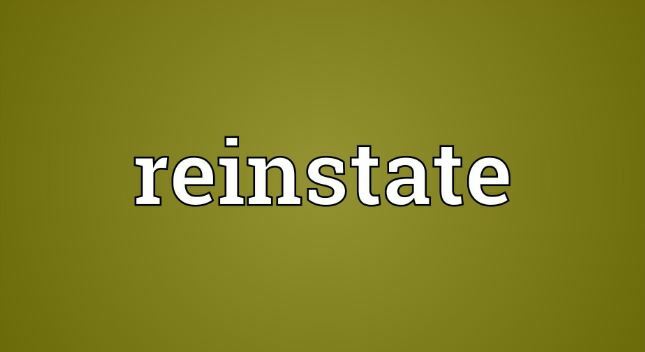 Now, let us continue with the reinstate process of the failed primary RAC database. As per the current status, the primary site ORCL_PRODRAC1 is failed and physical standby site ORCL_PRODRAC2 already converted as primary by failover process. So, now ORCL_PRODRAC2 is primary and ORCL_PRODRAC1 is failed primary which should be reinstated. During the reinstate using dataguard broker, the failed primary site will be flashbacked and converted as physical standby database, then the media recovery process will be started automatically started. These can be view in the alert log of the database which is to be reinstated. Operation requires shutdown of instance "ORCL1" on database "ORCL_PRODRAC1"
Operation requires startup of instance "ORCL1" on database "ORCL_PRODRAC1"
Attached the output of alert log of instance ORCL1 of database ORCL_PRODRAC1. From the above we can notice that the failed primary is now converted as physical standby database. If needed we can switchback it to primary. Refer here for the switchover process. In the previous article, we have configured the dataguard broker and performed the switchover from Oracle 11gR2 two node RAC primary to two node physical standby. In this article, let us perform the failover process. The environment details are provided below. Here, connect to the standby site and perform the failover process. Operation requires a connection to instance "ORCL1" on database "ORCL_PRODRAC2"
Failover succeeded, new primary is "ORCL_PRODRAC2"
From the above configuration we can see that the Database role for both failed primary site(ORCL_PRODRAC1) and new primary site(ORCL_PRODRAC2) is ‘Primary’ since the failed primary site crashed due to some unplanned outage and that site should be reinstated using dataguard broker. Service "ORCL_PRODRAC1" has 1 instance(s). Service "ORCL_PRODRAC1_DGB" has 1 instance(s). Service "ORCL_PRODRAC1_DGMGRL" has 1 instance(s). Service "ORCL_PRODRAC2" has 1 instance(s). Service "ORCL_PRODRAC2_DGB" has 1 instance(s). Service "ORCL_PRODRAC2_DGMGRL" has 1 instance(s). Switchover succeeded, new primary is "ORCL_PRODRAC2"
Instance ORCL1 is running on node prodrac101. Instance status: Open. Instance ORCL2 is running on node prodrac102. Instance status: Mounted (Closed). Instance ORCL1 is running on node prodrac201. Instance status: Open. Instance ORCL2 is running on node prodrac202. Instance status: Open. In the above configuration we can see that database role for both the databases has been changed automatically in cluster, whereas in the manual switchover this has to be done manually. Also, we can notice that the “Start options” is open and read only in old primary and new primary respectively. It is recommended to change this in the cluster manually. Let us verify in the database for archive gap. We can also verify the log shipping from the new primary to old primary by switch log in new primary and tail the alert log in old primary.